GAZA CITY (IRIN) – Frequent closures of the only crossing for commercial goods between Israel and the Gaza Strip have left the Occupied Palestinian Territory (OPT) short of gas for cooking and heating, businessmen say, affecting businesses, agricultural production and health services. Kerem Shalom crossing reopened on 26 June after two days of closure, described by the Israeli military as a response to rocket fire from Gaza. Israel has closed the crossing five times since the end of February after similar rocket fire, for a total of 15 working days, in addition to six days of closure due to holidays. 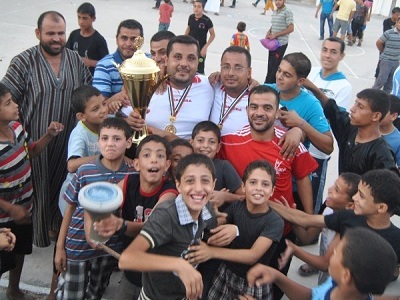 Before this most recent closure, Gazans said they were still recovering from the series of closures in the spring, which they say created a cumulative deficit in gas. 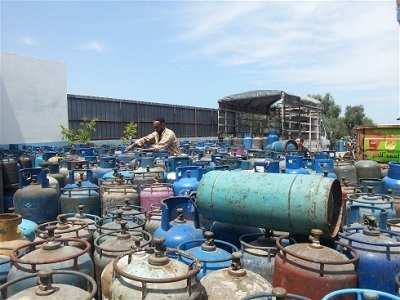 “Some people have been waiting for months to get their cylinders filled,” owner Yusri Daban told IRIN. He manages to fill about 1,500 per day, but is flooded with an equal amount of empty arrivals. Daban’s company used to receive 25 tons of gas per day for distribution. His share decreased to 18 tons due to the shortages, and has not been increased since. He says he needs 35-45 tons a day to deal with the backlog. Maher Tabba’, spokesperson of the Gaza chamber of commerce, says the shortages have affected production on farms, factories, bakeries and restaurants; and have added to the chronic power cuts by putting an even higher demand on electricity. Along the wall of Ahmed al-Ajrami’s bakery, about a dozen gas cylinders sit empty. His current stock covers him for just two weeks, he says. “I am [stuck] between gas shortages and power cuts which impact my business deeply,” he told IRIN. “Either way is very difficult, but we are trying to adapt to keep working and to serve customers.” He estimates that his revenue dropped by about 10 percent as a result of the recent shortages. Gisha, an NGO that campaigns for freedom of movement, describes the closures of Kerem Shalom crossing as a form of collective punishment against a civilian population, which is a violation of international law. “The additional closures of Kerem Shalom over the past months have aggravated existing shortages,” Gisha said. As a result of chronic shortages over the years, many businessmen have switched from gas stoves, to electrically-powered devices, incurring the increased costs of running a generator. According to the UN Office for Coordination of Humanitarian Affairs (OCHA), access restrictions, including repeated closures, have widened the gaps in key areas such as health, education, electricity, water and sanitation. Bassam Barhoum, a Palestinian health ministry official, said public hospitals and health centres need 4-4.5 tons of gas per month to feed patients and staff and disinfect bed sheets and clothing. Gas reaches Gaza through trucks that transmit gas from the Israeli side through a pipe at the crossing to trucks waiting on the Palestinian side. The trucks need special permission to enter the border crossing area. According to Gisha and the Association of Gas Station Owners, the pipeline operates from 8am to 3 or 4pm, at a capacity of 22 tons per hour, bringing in between 160-180 tons per day. But the Coordinator of Government Activities in the Territories (COGAT), the unit of the Israeli Ministry of Defense responsible for coordination in OPT, says the crossing has a capacity of 240 tons a day – a stance Gisha and others question. OCHA says access restrictions are just one of many factors at play in the gas shortages. Others include delays in the placement of orders by local gas dealers; the costs related to taxes and fees; a two-day weekend during which the crossing is closed; higher transportation costs due to the location of the crossing on the southern border of the Strip (a more accessible crossing point at Nahal Oz was closed in 2010); and the security coordination procedures between Israeli and Palestinian trucks on either side of the pipeline, which can sometimes take hours. Last week, Israel began allowing an extra truck of gas on some days, bringing an additional 20 or so tons of gas. But gas dealers say no longer-term solutions have been implemented. “So far all we’ve seen is promises,” al-Shawwa said.